Undesirable compounds, present in relatively small amounts in meat and meat products are referred to as residues. Maximum residue limits (MRLs) for pesticides in poultry meat and egg as recommended by Codex Alimentarius Commission (1993) and tolerance limits (TL) by MFPO for meat foods. Anti-coccidials and nitroimidazoles are not allowed for layer hens. 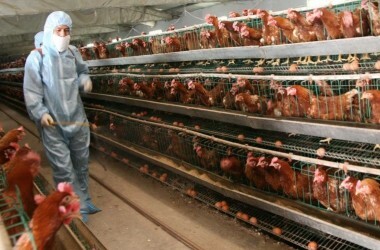 Control of residues in poultry products aid to the prevention of human health hazards. Drugs (sterols, hormones, antibiotics) should be used judiciously. Residual effects can be minimized by allowing sufficient withdrawal times. Use of anti-bacterials (antibiotics) and anticoccidials in feeds and pesticides in agricultural operations should be minimized. Use of nitrites in curing mixtures should be minimized as a precautionary measure. Mycotoxins can be controlled by proper storage and handling of feeds and feed ingredients. Mycotoxins are found in many oilseeds and cereals. Antifungal agents in feeds are helpful in reducing mycotoxin production. Extraction of aflatoxin in solvent, treatment with ammonia and formaldehyde, boiling in a salt solution can effectively reduce aflatoxins feeds. Following table shows maximum residue limit (MRLs1) for pesticides in poultry meat and tolerance limits (TLS2) for eggs (milligram per kg).